Notion’s Preferences dialogue has two parameters on its General tab that are critical to Studio One integration: the Enable ReWire and Allow Network Discovery tick boxes. Note that the Allow Network Discovery box is ticked and greyed out. Studio One has no notation features of its own, but it now forms a perfect pair with PreSonus’s dedicated Notion application. Ever since the release of Studio One, PreSonus have cast it as one component in a wider ecosystem. Hence, we have seen it gaining integration with the company’s StudioLive mixers, control from the CS18 fader surface, and closer integration with a new generation of audio interfaces. The latest move in this direction sees interoperability between version 3.3 of Studio One and PreSonus’s Notion 6 notation package. The essence of the communication is that audio and MIDI Note data can be exchanged in either direction via PreSonus’s UCNET protocol, which is also used in the company’s StudioLive and RM-series mixers, Universal Control software, and other products. You’re covered, whether you like to create in a DAW and then notate what you recorded, compose with notation and then create a full production, or go back and forth. 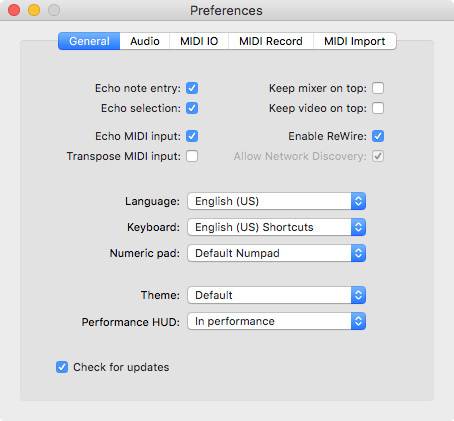 In addition to file exchange, Notion and Studio One can stream both MIDI and audio in real time using ReWire. The basic functions are extremely easy to use, but there are, of course, a few wrinkles. That comes with the territory, given that notation and inter-application communication are both notoriously finicky. The first, and biggest, wrinkle is that although Notion and Studio One can exchange data over UCNET or stream it using ReWire, only one of these systems can be active at a time — and switching between them is currently a multi-step process. The switch needs to be done in Notion’s Preferences dialogue (shown above), and you might think it would be as simple as a pair of radio buttons, so that ticking the Allow Network Discovery radio button (‘Allow UCNET Discovery’ would be a clearer and more accurate name) would cause the Enable ReWire button to be unticked, or vice versa. Alas no. Say you’ve captured ideas for some parts in Studio One and want to develop them working on their notation in Notion. With Studio One running, boot Notion and open Preferences. Is Allow Network Discovery ticked? If so, sending notes or audio from Studio One is as simple as choosing Send to Notion from the Song menu in Studio One and specifying whether you want notes from all tracks, notes from selected tracks, or a mixdown audio file sent to Notion. Notion opens a new score with the designated information and life is beautiful. In that situation, it really is that simple. As mentioned, sending Note data or audio files from Studio One to Notion can be as easy as selecting a command, but name Studio One tracks to match the names of Notion’s bundled instruments and, upon receiving the score from Studio One, Notion will instantiate the named instruments and assign them to the appropriate staves. Sending data to Notion via UCNET is easy. Just choose the command, choose what data to send and to which computer, and click Send. One example of an application for sending audio to Notion over UCNET would be if you wrote a song and wanted to add a horn section arrangement to it. That kind of scoring is easily done using notation, but you don’t really need notation for your whole rhythm section and vocal if you’re just scoring horns, so you can use Send to Notion to bounce the rhythm section and vocal to a stereo mix that appears in a new Notion score, along with tempo information. You can send any 44.1kHz/16-bit file to Notion by right-clicking on it in the browser’s Files tab and choosing Send to Notion from the drop-down menu that appears. Sending Note data from Notion to Studio One is just as easily accomplished by choosing Send to Studio One from the File menu in Notion and then the Send Notes button in the Send to Studio One dialogue that opens. New instrument tracks are created in Studio One for the Note data. If you use a third-party VST instrument in Notion, it should also be available in Studio One, in which case preset information is sent to Studio One, too, and the VST instrument instantiated. If not, you will need to assign sounds in Studio One. Of course, if you are using a high-end sample instrument such as EWQL Symphonic or Vienna Symphonic, you may want simply to send the audio from these instruments directly to Studio One. This is done with the Send Audio button in the Send to Studio One dialogue, which will create a new Song document with the audio files and a collection of metadata such as instrument names, tempo and time signature changes, and even rehearsal marks. If you have Studio One Professional, you have a fast method of transcribing solos from audio recordings. Select the track containing the solo you want to transcribe and press Command+M (Ctrl+M on Windows) to analyse it using Melodyne Essential. (Obviously, you can use any version of Melodyne you have purchased, too.) Now use one of my favouritefavorite tricks: make a new instrument track and drag the analysed events from the audio track to the instrument track. Boom! You have a MIDI transcription of the audio, which you can now send over to Notion to get notation of your solo. Pretty cool stuff, especially because it is so simple and fast to do, and my experiments turned out quite well in terms of accuracy. Streaming audio over ReWire is another way to get your high-quality sample instruments from Notion into Studio One while retaining the ability to edit the parts as notation. Note that both applications must run at the same audio bit-depth; either both run 32-bit or they both run 64-bit. Things are easy on the Notion side. In the Notion mixer, assign the faders you want routed to Studio One to one of the 32 bus pairs in the Output drop-down menu. Don’t be confused by the fact that the drop-down uses pair numbers such as 2L-2R, while the fader will show channel numbers (Ch 3-4). To bring multiple channels of audio to Studio One from Notion using ReWire, you must enable Notion’s outputs in Studio One’s instrument panel. In Studio One, instantiate Notion on an instrument track or in the instruments panel. You’ll see the Notion ReWire object dialogue. Now go to the instruments panel, expand the Notion instrument, and make sure the channels you just assigned in Notion are all ticked. This gives you a fader for each Notion output pair. With Notion as a ReWire slave, starting Studio One will play the Notion sounds. 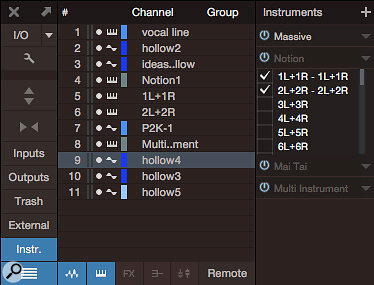 The Notion instrument object in Studio One offers a few options, the most important of which being Multiple MIDI Outputs. 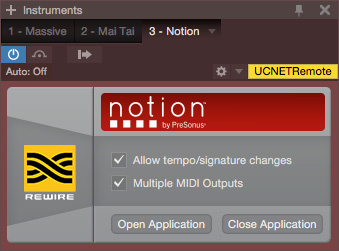 If you want to play one of Studio One’s instruments from Notion, you stream MIDI over ReWire to do it. In Notion, assign one or more staves to ReWire MIDI instruments in Score Setup mode. With a Notion instrument instantiated in Studio One, Notion can be selected as the input source for an instrument track, the output of which is assigned to play a Studio One instrument. 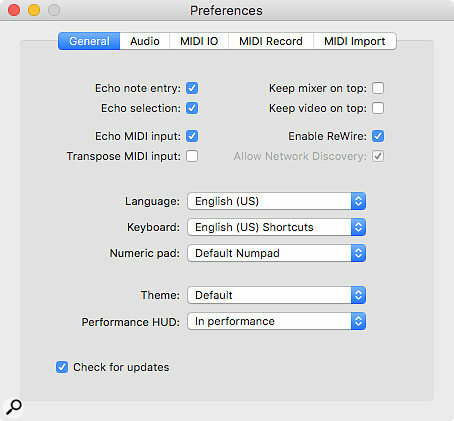 Once Notion is assigned as the input device, choose a channel of one of the 16 available MIDI streams from the drop-down menu. The Input Monitor button must be selected to hear the track played. The integration between Notion and Studio One is a big step, and it works pretty well as things stand now. PreSonus will surely clean up what’s there and add more functionality over time. While several DAWs have limited on-board notation capabilities and most can do ReWire, Notion is a full-featured notation package, and the data exchange features, and ability to output multi-channel audio from Notion, are powerful. There’s a lot that can be done through adding notation to Studio One.